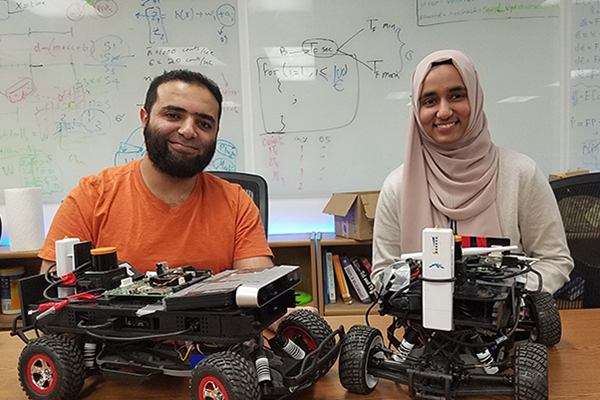 Two Electrical & Computer Engineering Ph.D. candidates, Fatima Anwar and Amr Alanwar have been selected as finalists for the highly selective Qualcomm Innovation Fellowship (QInF). They are advised by Prof Mani Srivastava in Networked & Embedded Systems Lab (NESL) at UCLA. The selection of the 2018 finalists was highly competitive. Only 30 proposals out of 174 candidates are selected (acceptance rate 17.2%). They are working on providing Trusted Notion of Time (TNT) for Resilient Autonomous Driving. They argue that current time infrastructure and services are highly susceptible to attacks leading to catastrophic consequences. They believe it is imperative that we rethink clock hardware architectures and software timing stack to secure time. Their research leverages Trusted Execution Environments (TEEs) and secure state estimation techniques to ensure that time-based primitives are secured across all layers of a stack. The finals will be held at Qualcomm headquarters in San Diego on April 17th and 18th. Good Luck!